Business T1 Line. Los Angeles T1 Internet Service Provider. Quality T1 Connection for LA and OC. Bonded T1 Access. Business ISP LA T1 Services. Broadband Internet Service for California. - Is it time to replace your current connection with a T1 line? - Are you moving to new office space and require a new business T1 installation? - Do you require high speed T1 internet service to support your commercial applications or large number of users? From ordering to installation, you can rely on DigiLink to provide your business or organization with fast and reliable T1 Internet services. If you are looking for your own personal line of bandwidth, DigiLink offers excellence in T1 service. Consider it similar to having your own lane on the freeway, dedicated to you, with no one able to share, or interfere with your ability to pass traffic. Bandwidth for a full Business T1 line from DigiLink is 1.5 megabits per second, for both uploads and downloads (simultaneously, as our Business T1 service is full duplex). For businesses that require higher bandwidth we provide Bonded T1 Service, which is two or more T1 lines joined together for aggregated bandwidth up to 9.0 Mbps. Beyond 9.0 Mbps please consider our Business T3 Service, usually a more cost efficient path. We also proudly offer state of the art Dedicated Wireless Connectivity options for businesses located within 10 mile radius from Marina del Rey, CA. 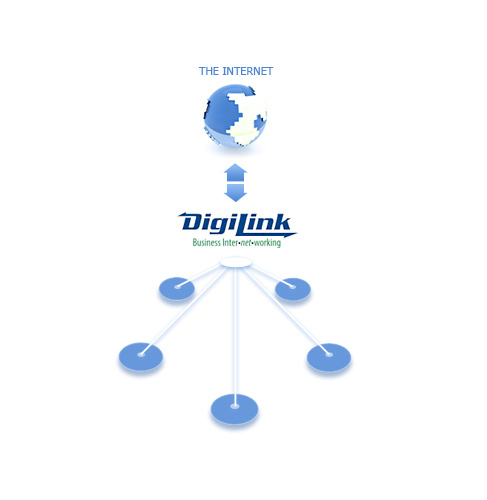 A Dedicated Internet T1 from DigiLink provides fast and reliable internet access for your business or organization. We offer our standard T1 service with local loop included. At DigiLink, we engineer high performance service directly from your business to the core of our fully switched network, via carrier class fiber optic connections. This results in completely uncongested T1 connectivity with one hop onto the internet, without the need to go through failure prone remote Points of Presence. Los Angeles ISP since 1994, we can bring our experience to the table, solving your problems quickly and efficiently. We ensure that dedicated bandwidth is available at the backend through our multiple Tier 1 connections making sure that you can, if required, max out this connection 24x7. The local loop (or "last mile") of most circuits is provided by your local telephone company. Fortunately, when you procure your services from DigiLink, you don't get stuck having deal with the phone company. We will procure services from them on your behalf, and supervise the installation. Should a problem arise with your local loop, we deal with the phone company on your behalf. It is important to note that the phone company holds itself to different standards of responsiveness depending upon the circuit type. DSL service is considered by the major telecommunications companies to be a low-end residential class service, and as such, they generally make few guarantees about how quickly they will respond to problems with DSL loops. On the other hand, T1 circuits are treated as mission critical business services, and outages are responded to relatively quickly (typically within a couple of business hours). Get the reliability of a T1 circuit, with high data throughput, and the service you can only get from your Local ISP. Installation time for a business T1 line is typically within 10 business days.